The BMW I3 is a lovely hunk of automobile, the kind of vehicle you would save up for years to buy, and then polish with a diaper. Hold on there, sir. Do you really want to drive this masterpiece of engineering with a Samsung Gear S smartwatch? 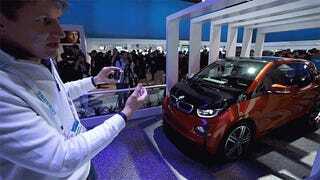 At CES BMW is illustrating how the future of driverless cars might be powered by the company's proprietary cloud. To do it, a BMW barked commands at a a smartwatch, telling it to come out of the garage and pick him up outside. After a short delay—Wi-Fi in the Las Vegas Convention Center is a disaster—the smartwatch processed the command, and the car lurched forward. No driver. It just moved. The toe-headed German BMW rep jumped out in front of the moving vehicle, like a man with a death wish. And to my surprise, our German friend did not die. The car stopped short of clipping his legs. The car stopped because of the ultrasonic sensors in the front of the vehicle. In fact, all of the technology being used in this demo already exists, the only thing that needed to be built for CES was the voice and smartwatch integration. Of course, you're not likely to see a car that picks you up outside your house any time soon because of the law and lawsuits. 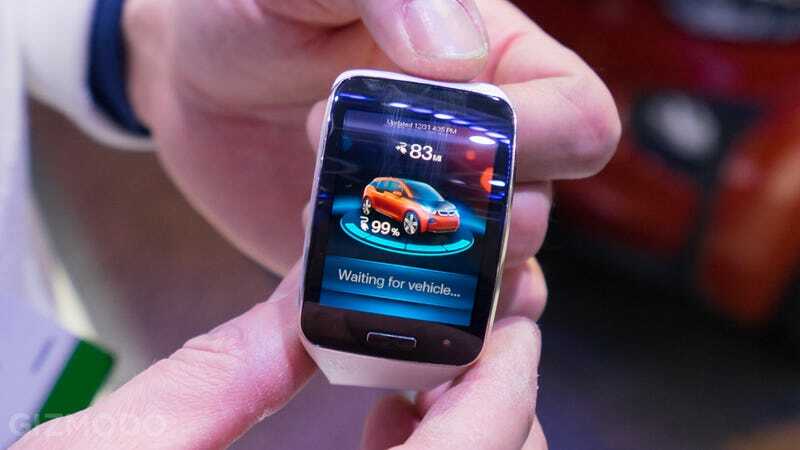 But hey, maybe one day you'll be able to drive a car with the smartwatch on your wrist—hell maybe one day smartwatches will actually be good enough to wear. Pshhhhhh. Let's not get ahead of ourselves.